It's that time again! 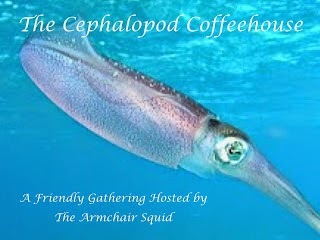 Welcome to The Cephalopod Coffeehouse, an online gathering of bloggers who love books, hosted by The Armchair Squid! If you're interested, please sign on to the link list at the end of this post. Come on, do it - it will be fun! This month, I decided to dive in to The Goldfinch by Donna Tartt. It's a whopper (784 pages), but it definitely has a following. It won a Pulitzer Prize for fiction - that ain't too shabby, eh? The story revolves around the character of thirteen year old Theo Decker, who has found his life in shambles when a bomb goes off at the Metropolitan Museum of Art, killing his beloved mother and other innocent bystanders. A dying man implores him to take a painting: The Goldfinch, made in 1654 by Carel Fabritius. From that point on, the painting becomes a tie to his lost mother and his past as the adult Theo travels the world, carrying his guilt and grief along for the ride. Needless to say, I am no writer, unless you would allow me that designation because I know how to use a pen for handwriting. Prior to whipping up my review, I was compelled to look at the reviews of other more insightful literary reviewers (very unlike me); I usually am true to my initial feelings about something and just go with it. My opinion is worth every cent you pay for it, after all. However, I questioned my own judgement. The word "Dickensian" was thrown around in many of the reviews, and I can agree that there were quite a few characters that I felt were very much like a those that old Charles might concoct - but this was not A Tale of Two Cities or Great Expectations. There's the sneaky, wildcard of a father, who might not be a very good role model. Don't forget the druggie girl friend, named Xanadu, who tries to pop pills and snort coke as a way to the readers' heart and the foreign pal, Boris, who has a little comic relief - but not much. Ah, heck, throw in some gangsters and furniture restoration, just for good measure. It's got a little bit of everything and it won a PULITZER PRIZE, people! Then - why didn't I just love it? Though I'll never get those hours back, I'm not sorry I read it. In retrospect, I may just be saying that because it was me doing the reading - I'll trudge through anything, I hate to put a book down. Yet, I can't say I'd run out and buy it as a Christmas gift for someone else. That's the real litmus test. Would I pass it on to someone else, with a big thumb's up? Analyzing my feelings about the book, I realized I read the other reviews because I was swayed by the hype, and I kept thinking "everyone says this is a fantastic book...what's wrong with me?" Something about it felt like it was trying too hard to have a great, enduring, artsy message - but maybe it didn't have the substance to pull that off. Maybe it needed to be a thousand pages long...naw, I'm gonna say five-hundred. The Dickens-like characters? They gave me a mental picture of Donna Tartt typing and saying to herself, "I need some Dickens-like characters." My ongoing plot assessment alternated between "oh-come-on" and "when-will-this-be-over," punctuated with periods of "well, that was a pretty interesting metaphor or simile." Maybe I don't know what it takes to have a Pulitzer prize winner...you don't see any books with my name on your shelf, so what do I know? It was a little disappointing after waiting for the other 64 people ahead of me on the library request list to finish it and give me a shot. I'm glad I didn't purchase it. I don't want to ruin it for someone else, remember that some people sing it's praises - and I'd love to hear another opinion (Stephanie Faris, do you hear me?). I definitely balk at the reviews I read. There are big sellers out there that I'm stymied to understand. Characters I hated, who go on and on doing things I hate--and garnering 5-star reviews like rice at a wedding. I've also read a ton of stinkers, that deserved to be sunk. Experiencing a book is less about reading than consuming, for me. If a book didn't consume me--didn't keep me up too late, or make me wake in the middle of the night yearning for a few more pages of story, well, then it was simply okay. Entertaining, but not likely to be revisited. Sounds like that's where this book hit you. I find it's true of a lot of literary fiction, for me. I often can't engage in a meandering story unless there is something for me to latch on to--usually romance or the hope of it. I think that why I couldn't finish GONE GIRL. I felt so betrayed 75 pages in, I just closed the book and returned it. I'll admit, it takes a lot to get me to commit to a 500+ page book. It's why I've shied away from this one for so long. I think I'll continue on that path. Dickens isn't a fave, so the thought of a Dickensian novel is...not at all intriguing to me. So, to sum up: you are not alone. Wished you enjoyed the book more. Thanks, Veronica! This isn't the first time that I've been the odd one out. By the way, thanks for telling me you didn't like Gone Girl...that one was on my list, too, and I'd rather skip it. There's not enough read time in the world, why waste it? Great review! I had a good friend who decided to 'better' herself by reaidng Pulitzer Prize-winning books. Every last one of them was, she said, nothing she enjoyed, starting with THE HOURS. She puzzled over what tied all those prize-winning books together, and she finally concluded that the prizes were awarded not because the books told stories well and brought the reader along, and 'spoke' to the reader. No, she said, the books were (pick one or two) surprising, startling, artsy, mold-breaking, leaves you dazed Or whatever. She said she thought the prizes were awarded by professionals who had lost the ability to enjoy a story and were, instead, simply looking at window-dressing, rather like a famous photo of the owner of a roller-coaster, taken during a ride. Everyone else was screaming, laughing - and he was looking supremely bored. I ain't gonna comment. I also appreciate the points of your review, and I ain't gonna read The Goldfinch (which had sounded interesting). I'll pick up GREAT EXPECTATIONS instead. Me, too, Diana! I AM the chick who loved Dickens. Why go for "Dickensian," when I could have...Dickens! Your comments are very interesting; thanks for the input. I'm not sure why I didn't trust my own opinion, initially, but I kept saying to myself, "I'm not feeling it..."
"My ongoing plot assessment alternated between "oh-come-on" and "when-will-this-be-over," punctuated with periods of "well, that was a pretty interesting metaphor or simile." "
Aiming at "cracking up" is more of what I am comfortable with in the long run, ha ha. Boy, I appreciate hearing that I am not the only one. I feel out of my element surrounded by some fine writers (like yourself!). Diana went above and beyond - that was a great comment! Please don't apologize for getting your am and pm mixed up. I always come to the Flipside with Great Expectations. This post didn't let me down. It was, to be honest, a little long, and I had a Dickens of a time getting through it. It turned out to be A Tale of Two Sittings (with a potty break between). Thank you very much for reviewing The Goldfinch. (May I assume it is not related in any way to the Academy Award winning motion picture Dr. Goldfoot and the Bikini Machine?) Like you I don't run with the herd, preferring instead to form my own opinion about a book. For example, I didn't read any of the reviews before devouring The Cat in the Hat. PULITZER PRIZE - SCMULITZER PRIZE - I am proud of you for going with your gut and not letting all the hype sway you. You're wrong. There IS a book on my shelf with your name on it. Friendship 101: How To Be The World's Best Blog Buddy by Cherdo (with a forward written by Janie Junebug). In my book, you're tops, Cherdo. Have a safe and happy weekend, dear friend! Shady, once again - you make my day! A day without Shady is like...Saturday or Sunday. Which is coming up and you need to have a great one! Where's that next installment of Shady Dell Music and Memories? I need my fix! You, me and Janie need to come up with our own blog hop idea for the humorists and quirky. Start thinking of names for it, I'll do the graphics for the button or banner to link. Hubby is home and we're off to a festival (to make sure we don't let our caloric intake dip down to the normal range - it's Greek food for lunch!). That is a lot of pages to read through when the book wasn't really that much enjoyment for you! While I have heard others mention it, this one has yet to make my list of "must reads." It may be awhile before it does, now. Thank you for your honest review! I like the way you wrote this post a lot, Flipster. Especially where you addressed Stephanie Faris. It felt like a real book-lover's gathering. I'd love to meet you in person. Come on by, Suze, and I'll make coffee. My view of critics is that, often, when they don't understand something, they give it high marks, because they don't want to admit that they didn't get it. The problem is that there's often nothing to get. I had a teacher like that in college. He couldn't distinguish "deep" from "confusing" so graded them both the same. I love reading, one of my greatest pleasures in life! I haven't read this. I don't think it's on my Amazon wish list, but who knows when my wish list has about two million titles on it. In spite of the Pulitzer, a lot of people have mixed emotions about this book. Many agree with you, and it's no wonder because you are a genius. You remind me of the Energizer Bunny! You've got staying power now, Janie. You just needed practice hanging on. I think you just slid off the other pages. Is that a challenge? LOL. That sounds like a LONNNNNNNNNNG book! I don't keep stats but I'm pretty sure The Goldfinch has popped up more often that any other book at the Coffeehouse. I haven't read it myself. I also have a hard time giving up on a book, even when my feelings for it are only lukewarm. It's Joseph Heller's fault. If only every book ended as well as Catch-22 does. The Pulitzer effect; but it might just be me. Like I said, some people love it. Thanks, again, for the Cephalopod Coffeehouse - it's great! My pleasure, Cherdo! I look forward to it every month. Someone recently recommend this book to me, but I didn't really know much about it. I look forward to hearing more about it- but it sounds like a book I can definitely wait to read. I had no idea it was so long (not that I mind long books if they are riveting). :) Thanks for sharing your honest thoughts! I'm sorry, but the word 'DICKens' makes me giggle. But, I AM a little disturbed that a grown man would giggle. Ha ha ha...I'm disturbed that I giggle at a grown man being disturbed at his own giggling. I have trouble putting down a book without finishing it, too. Maybe it would feel too much like losing a challenge or failing at something. Yeah, it's like I don't want to abandon it...it might be on the verge of getting good! I've been wanting to read this book, more out of curiosity now than anything else. Will I like it and think it's awesome or...not so much.